The goal of this project is to increase patient care capacity by providing a new bed tower and expanding the existing emergency department. This project includes provisions for additional future expansion. The bed tower is structured for three future floors and space has been dedicated on the campus for a future bed tower adjacent to the tower proposed in this project. An additional parking garage is required to support this project’s parking requirements as well as replace displaced parking; this garage is being provided by a separate project. The existing helipad, located on the roof of the fourth floor Rothman building, flight patterns will not be impacted by this project. The future fourth, fifth and sixth floors may impact flight patterns or helipad location and would require further study at time of vertical expansion. A new remote central power plant is being constructed outside the scope of this project to provide additional capacity to the facility, which will be sufficient to support the new bed tower and emergency department expansion. 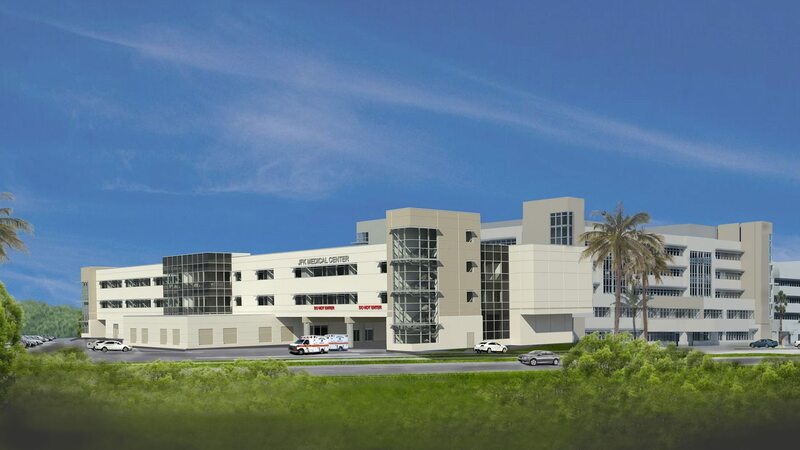 To help meet a community need for Labor and Delivery Services, TMP designed a renovation project which added a Women’s Center / Obstetrics Department to JFK Medical Center in Atlantis, FL. The new Obstetrics Department was designed to be stacked on the third and fourth floors within the portion of the hospital called the Rothman Building. The renovation provided six state of the art Labor and Delivery Rooms, a Cesarean Suite, Post Partum Rooms and a 12 Bed Nursery. In addition, the staff and support space was designed around the classic race track corridor system, complementing the existing building proportions to provide maximum efficiency in care. New Women’s Center / Obstetrics services to the campus. Designed to complement the existing structure / proportions. Efficient race track patient corridor system. Support space for C-Section Rooms including control desk and holding / recovery bay. Nursery with public viewing space.